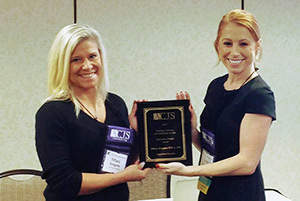 Tiffany Kragnes (left), Upper Iowa University Assistant Professor of Criminal Justice, is pictured accepting the Teaching, Learning and Scholarship Innovative Design Award from Colby Valentine, Teaching, Learning and Scholarship Section chair, during the recent Academy of Criminal Justice Sciences Annual Meeting. Upper Iowa University Assistant Professor of Criminal Justice Tiffany Kragnes was awarded the Teaching, Learning and Scholarship (TLS) Innovative Design Award during the recent 2018 Academy of Criminal Justice Sciences Annual Meeting in New Orleans, Louisiana. Kragnes was awarded for the innovative teaching method she, along with UIU Associate Professor of Business Christopher Kragnes Sr., has employed with students working as legal interns on felony murder cases. In this capacity, students receive real-life experiences and work firsthand on a criminal case, while meeting weekly to discuss legal strategy and developments. Tiffany Kragnes received a $50 cash award and a plaque of recognition during the awards ceremony. As part of the annual meeting, she was also elected to a three-year term as executive counselor for the TLS section. A previous Bridge article about the Kragnes’ innovate criminal justice program can be viewed here.